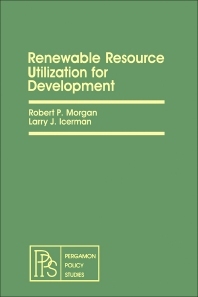 Renewable Resource Utilization for Development is a six-chapter text that covers the United States initiatives in field of appropriate, light-capital technology for renewable resource utilization. These initiatives include steps, policies, and programs that the U.S. government might take, adopt, or support to aid developing countries in utilizing appropriate technology for renewable resources for the benefit of the poor majority. The first two chapters describe the technology, advances, design, and utilization of wind energy and biomass. The next chapter focuses on two applications of direct solar energy, namely, solar drying of crops and timber. Another chapter highlights the optimum processing and use of rice bran, which is an important postharvest and rural development problem for rice-growing developing countries. The final two chapters discuss the utilization of material and products based on agricultural wastes and natural fibers. These chapters also deal with the organizations and mechanisms for implementing the initiatives and with possible next steps to the U.S. initiatives. This book is of value to economists and environmental pollution control researchers.